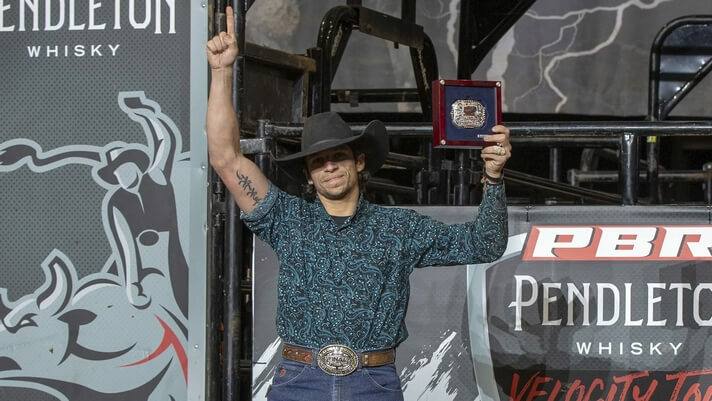 EDINBURG, Texas – As the dust settled inside of Bert Ogden Arena on Saturday night, PBR’s (Professional Bull Riders) Junio Quaresima (Meridiano, Sao Paulo, Brazil) won the Pendleton Whisky Velocity Tour’s Edinburg Invitational. Following an 84-point ride aboard Dirty Little Secret (CBT5/ Harris Bucking Bulls) in Round 1, the Brazilian cowboy was the only rider to record a qualified ride in the championship round. Despite a low score of 64.5 aboard Border Bandit (Covenant Livestock), the win earned him 170 world points and a $7,900 paycheck. Every winner of a Pendleton Whisky Velocity Tour event has an opportunity to compete at an Unleash The Beast series event, and with the victory in Edinburg, Quaresima will go to Little Rock, Arkansas, for the Bad Boy Mowdown on March 1-2 at Verizon Arena. Veteran Sean Willingham (Summerville, Georgia) finished second, collecting a paycheck for $4,700 along with 140 world points. He rode to the runner-up finish compliments of his impressive 88.5-point ride aboard Cido (Rockin R Bucking Bulls) in Round 1. Star Flight (Cooper/Scruggs Bucking Bulls) got the better of Willingham in the championship round, bucking him off in 4.63 seconds. In a tie for third place, veteran Brazilian Wallace Vieira de Oliveira (Goiania, Brazil) and Texan Tye Chandler (Celina, Texas) recorded matching 86.5-point rides in Round 1. Early in the round Oliveira conquered Mojo (Baker & Hurst) while Chandler was the last cowboy to fire out of the chutes in the opening round to make the 8 aboard Blame It On The Whiskey (JQH Bucking Bulls-Skip & Elaine Jones). While neither rider had a successful ride in the championship round, they both leave the Lone Star State with $2,500 and 55 world points. A pair of matching 86-point scores in the opening round left Brazilian Alex Marcilio (Macaubal, Brazil) and home state rider Mason Taylor (Maypearl, Texas) in a tie to round out the Top 5. In the first section of the night, as his home state crowd cheered, Taylor covered Eight Ball (Hudgins/Frenzel). Marcilio made the 8 in Round 1 aboard Life As A Gangster (Harrison/Swearingen/Hart). Both riders were dispatched from their bulls in the championship round but collected 12.5 world points and $850 paychecks. Flash Gordon, a bovine athlete owned by Bill Saunders, took home the top spot for the evening. He received a 45-point bull score after firing out of the chutes and dispatching Taylor in 3.90 seconds in the championship round. The Velocity Tour next travels to Jacksonville, Florida, for the Lucas Oil Chute Out, on February 16. 1. Junio Quaresima, 84-64.5-148.50-170 Points. 2. Sean Willingham, 88.5-0-88.50-140 Points. 3. Wallace Vieira de Oliveira, 86.5-0-86.50-55 Points. (tie). Tye Chandler, 86.5-0-86.50-55 Points. 5. Mason Taylor, 86-0-86.00-12.5 Points. (tie). Alex Marcilio, 86-0-86.00-12.5 Points. 7. Cawl Braithwaite, 85.5-0-85.50-2.5 Points. (tie). Lawson Nobbs, 85.5-0-85.50-2.5 Points.